The Mighty Deities of Ancient Greece in a Two-Coin Set! From their perch on top of Mount Olympus, the gods and goddesses of ancient Greece ruled over mortal and immortal alike. Through stories of conflict and bravery, deceit and intrigue, reward and punishment, the tales of Zeus and Hera's court provided drama and guidance for an entire civilization. And while millennia has passed since the peak of their influence, the stories of these legendary figures still entertain through their immortal poems, ballads and songs. So it's no surprise that these deities have inspired the artisans of Australia's Perth Mint, one of the most acclaimed official mints in the world, to create one of the most phenomenal silver coin sets to ever arrive at our vaults. Weighing in at seven total ounces of 99.9% fine silver, this 2017 Cook Islands Gods and Goddesses High Relief Antiqued 2-Coin Set is definitely one for the ages! 13 ANCIENT GREEK GODS AND GODDESSES ON MOUNT OLYMPUS . . .-- The legends of Greece are here -- Zeus, Hera, Poseidon, Demeter, Athena, Apollo, Artemis, Ares, Aphrodite, Hephaestus, Hermes, Hestia and Hades -- all featured together in a lushly illustrated scene that perfectly exhibits each one's role in the Greek pantheon.
. . . ALONG WITH HADES ON HIS OWN TURF!-- This set also includes Hades -- lord of darkness and brother to Zeus and Poseidon -- with his own design, accompanied by his three-headed hound Cerberus in his underworld realm. 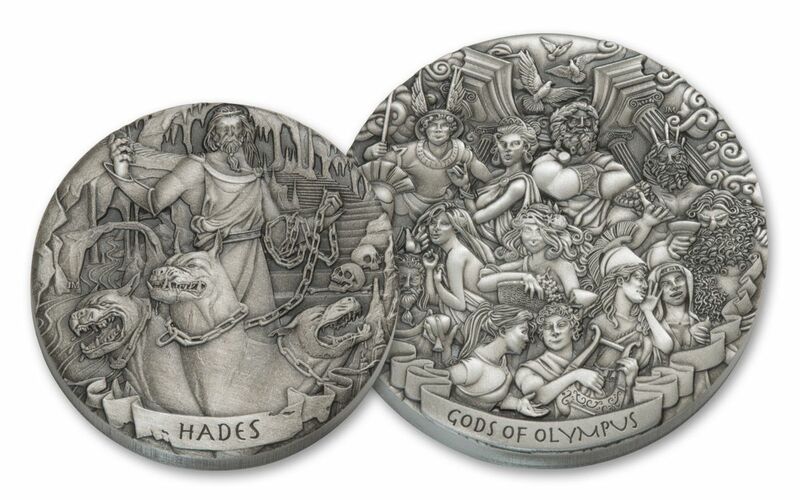 EXPERTLY STRUCK IN HIGH RELIEF-- On five-ounce (Gods of Olympus) and two-ounce (Hades) canvases of 99.9% fine silver, these coins are skillfully struck in high relief using state-of-the art technology. The time and craft that goes into the creation of these coins produces extraordinarily detailed designs, made even more stunning by a gorgeous antiqued finish. COOK ISLANDS LEGAL TENDER-- The 2017 Gods of Olympus coin in this set is five dollars legal tender for the Cook Islands, as seen on the coin's obverse along with a profile of Her Majesty Queen Elizabeth II. 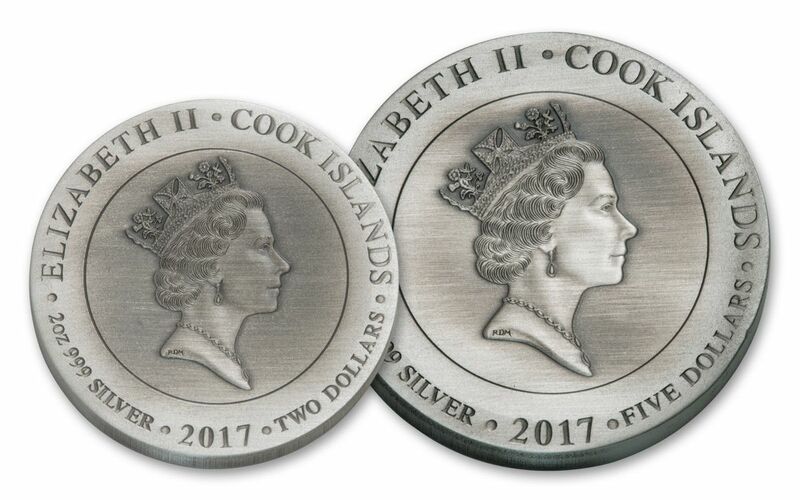 The 2017 Hades coin is two dollars legal tender, also for the Cook Islands. FANTASTIC PERTH MINT PACKAGING-- Each coin in this set will arrive in its own individual case, accompanied by its own numbered certificate of authenticity. A LIMITED-MINTAGE EVENT! -- No more than 500 of these sets will ever be possible, due to the limited mintage of these coins. Not only that, but many of these coins have already been secured individually or as part of other collections, making two-coin sets like this all the rarer! This set is a WORLD EXCLUSIVE that's only available through GovMint.com -- you won't find this release anywhere else! Demand for other installments of this series was already intense, and we're expecting this set to quickly disappear from our vaults. Make it yours today, or you might have to wait another millennium or two for another like it!